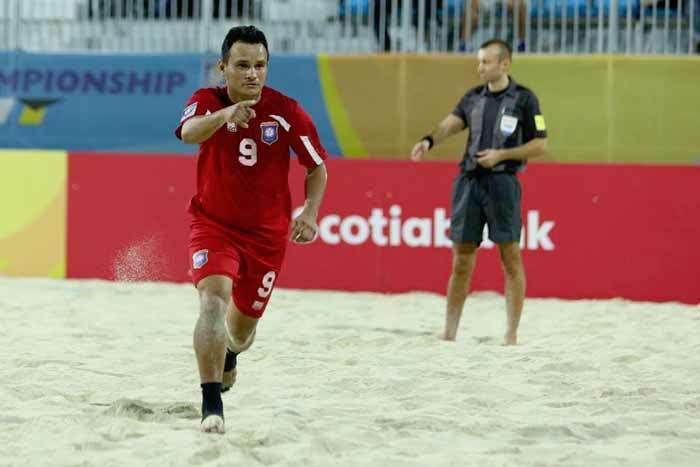 LESLY St Fleur missed a hat trick but he connected on a pair of goals and Gary Joseph added the other as the Bahamas team electrified the crowd for the second consecutive night at the CONCACAF Beach Soccer Championship with a 3-0 victory over Belize. #The crowd in the new beach soccer stadium at the foot of the Sir Sidney Poitier Bridge grew larger than the opening night on Monday when the Bahamas knocked off Guyana 4-1 and once again they were entertained by a superb performance by the host team as they advanced to the quarter-finals. #With seven minutes and 34 seconds on the clock in the second period, Lesly St Fleur retrieved the ball after kicking in a side kick and booted in the first goal for the Bahamas for a 1-0 lead. The goal came after the Bahamas got off to a slow start after being more aggressive in the first third.Two minutes later, Kyle Williams got a crisscross pass to St Fleur, but he missed his second attempt at the goal. #It wasn’t until 7:01 left in the third third that Joseph faced the goal and connected with a shot up the middle for the Bahamas’ second goal. #Goalkeeper Ivan Rolle made three consecutive saves before St Fleur got an assist from Williams with 5:22 left in the game for his second goal and a 3-0 lead for the Bahamas. On the next play, St Fleur got to the left corner of the goal but his attempt at the goal just clipped the goal post. #“We’ve been training hard for this, so all of the effort was put into the game. I trained hard, so I wanted to come out here and play hard,” stated St Fleur, who increased his goal total to five over the two games after his hat trick against Guyana. #Goalie Rolle got a bit shaken up on an inadvertent hit from Belize’s Jeremy James. That resulted in Williams coming to his aid. Team physician Eugena Patton checked him out and he was eventually replaced by Torin Ferguson as the Bahamas held on for their second straight win. #“We’ve been pressuring him a lot and at least he’s showing up right now, so all of the pressure we’ve been putting on him, he’s showing up and doing his part,” said St Fleur of Ivan Rolle, the tall, lanky goalie. #The game opened with Meza getting a penalty kick on Dwayne Forbes’ foul. But his shot went wide of the goal post. It turned out to be a physical first third as the Bahamas blew a number of opportunities to touch the back of the net. Forbes and Lesly St Fleur came close to booting in the Bahamas’ first goal, but neither got the opportunity to score. #It was Jean’s chance, but he missed an attempt right up the middle. On an assist from St Fleur, Williams fell short of his attempt. So did captain Gavin Christie on his left corner shot. #Meza was the recipient of another penalty shot on Jean’s foul, but he once again missed the chance to score. #Just before the period ended, Christie had another attempt at a goal, but he was stopped by two defenders right in front of the goal post. #The Bahamas, coached by Alexandre Soares and Stephen Bellot, will now prepare for a big showdown 8pm tonight against Jamaica, who rebounded from their 5-5 loss on 2-0 penalty shots to Belize in their opening match on Monday by knocking off Guyana last night just before the Bahamas played Belize. #In the other games played yesterday, Guadeloupe got their tournament debut win 5-4 over hapless Barbados, who dropped to 0-2; Panama also opened play with a 1-1 (2-1 on penalty win) over Costa Rica, who fell to 0-1; El Salvador also kicked off tournament play with a 9-2 rout over the Turks and Caicos Islands, who are 0-1 and Mexico improved to 2-0 with an 8-3 thrashing of Canada, now 1-1. Last edited by Marty; 03/24/17 01:35 PM. Guyana secured their first win at the 2017 CONCACAF Beach Soccer Champion-ship, dismissing newcomers Belize 4-1 on Wednesday at the Malcolm Beach Soccer Facility, Bahamas. Deshawn Joseph bagged a double in the fourth and 29th minute, while Jahshawn Moore and Jamal Haynes netted in the 24th and 25th minute, respectively. For Belize, an own goal in the fifth minute was the only noteworthy moment. Team Panama won the championships. Team Belize won four games and lost two in the tournament. Belize Forward Marlon Meza shares Golden Boot Award with Mexican Forward Ramon Maldonado. Congratulations Marlon on this great achievement.